Anyone paying attention to film knows the name of William Friedkin. The Chicago-born director is best known for The French Connection with its iconic chase sequence and The Exorcist, a film Friedkin frequently avoids referring to as a horror film and more as an exploration of faith and yet, nevertheless, it’s often considered one of the best horror films ever made, if not the best. While these are certainly Friedkin’s best known films there is more to his career than just two feature films and he’s bringing another one to theaters this year with Killer Joe, an NC-17 rated darkly comedic thriller based on the Tracy Letts stage play starring Matthew McConaughey, Emile Hirsch, Juno Temple, Gina Gershon and Thomas Haden Church. The film had its world premiere at the Venice Film Festival in September 2011 and was quickly followed by a North American premiere at the 2011 Toronto Film Festival, which was when I saw it, greeted by an eyeful of Gina Gershon’s pubic hair and McConaughey doing things with a fried chicken leg I never could have expected. It’s hard to argue against the reason for the rating, but is it fair? Friedkin has an answer to that and plenty more. Back in June, Friedkin was awarded the Seattle International Film Festival’s Lifetime Achievement Award on June 9, a day later I had a chance to sit down and discuss not only Killer Joe and the MPAA with the Oscar winner, but we discussed everything from The Exorcist to The French Connection; the state of filmmaking today including 3-D (he’s not a fan), digital vs. film (he shot Killer Joe on digital) and we get to the bottom of the French Connection Blu-ray debacle. We discussed his lawsuit with Universal and Paramount over the rights to his excellent 1977 feature Sorcerer, how he got Gene Hackman to deliver his Oscar-winning performance in The French Connection and how he enticed Linda Blair with milkshakes during the shooting of The Exorcist. I also ask if he’s seen any of the Exorcist sequels and did Howard Hawks really give him the push he needed to direct The French Connection? My conversation with Friedkin lasted just shy of an hour and therefore is simply too much for just one piece so I’ve broken it up into three separate articles, the first of which I am posting today and will follow with parts two and three over the course of the next two days. After recently watching several of your films in preparation for this interview, there is a distinct theme of “good vs. evil” and “right vs. wrong” in almost all of your features. With Killer Joe I’d argue some of that even leaked into the filmmaking itself. Is this what attracted you to the material? William Friedkin (WF): I feel good and evil exists in everybody. Every human being I’ve ever met, know or read about is a combination of good and evil impulses and it’s often a struggle for our better impulses to prevail. So that tends to be what the characters in my films are all about. I’m not interested in making a film that’s superficial or a romantic comedy or something that has nothing in relation to human behavior, but, [instead], is all about easy laughs. 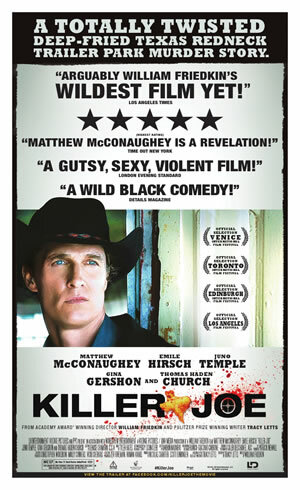 Killer Joe deals with all the ancient verities — good, evil, sin, life, death, retribution, vengeance, salvation in a way — it’s written by a superb, Pulitzer Prize-winning dramatist. I was attracted to the script first and then later I think about what the hell it was that got me interested in these things, and it’s all the things I just mentioned that I’m not aware of the first time I read it, I’m just intrigued. With your films I notice you do your best to present your characters with an extreme level of honesty. What is your approach to character presentation in terms of getting the audience to see them for who they are? WF: I don’t have one particular viewer in mind. I hope the films will get intelligent viewers, people who think and reflect on what they’ve seen, but I don’t know who sees my films. There’s a cross-section of people from everywhere around the world so I don’t try to tailor them. They’re, of course, written for an audience. They’re written for good actors and to be presented to as large an audience as possible, but it’s not going to be an audience as large as something where a guy is wearing a sweater with a big letter on it and flies around in a cape and gets all the bad guys, nor is it a video game. Those are the biggest pictures around today, films that are made out of video games and comic books. And what are your thoughts on the MPAA rating? I know you say you don’t make a film for a certain audience, but at some point is there something inside you that wonders if you made the right decision maintaining the film’s NC-17 rating? WF: No. Cutting would not have made it mass appeal. Cutting it would have been the equivalent of what members of the United States government and military leaders said about the Vietnam War. They said, “We have to destroy Vietnam in order to save it,” and that’s what I would have done to Killer Joe. To get an R rating I would have had to destroy it in order to save it and I wasn’t interested in doing that. The ratings board is a phony organization. They’re a self-governing body of the major studios. They have no legal standing whatsoever. The fact they say no one under the age of 17 can come into a theater, even with a parent is not legally enforceable. They’re not going to fine somebody. They’re not going to put them in jail. It’s all, again, a subjective judgment on the part of the ratings board.